Ridgecrest is located in the southern portion of the Indian Wells Valley, surrounded by four mountain ranges; the Sierra Nevada on the west, the Cosos on the north, the Argus Range on the east, and the El Paso Mountains on the south. It is approximately 80 miles from the Lancaster/Palmdale area and approximately 125 miles from both Bakersfield and San Bernardino, the three nearest major urban centers. As the only incorporated community in the Indian Wells Valley, Ridgecrest acts as the urban center for northeastern Kern, Inyo and San Bernardino Counties. The City's incorporated area includes approximately 13,300 acres Ridgecrest is host to the famed federal research and development laboratory at China Lake. Ridgecrest is located in the Mojave Desert east of the Sierra Nevada Mountains and west of Death Valley National Park. The meteorology in the Indian Wells Valley is predominantly influenced by its high desert location. The climate is characterized by hot days and cool nights, with extreme arid conditions prevailing throughout the summer months. The mean annual temperature for the Ridgecrest area is 65 degrees F. There are wide annual temperature fluctuations that occur from a maximum of 118 degrees F to a minimum of 0 degrees F.
Death Valley National Park: There are 9 campgrounds within Death Valley NP. 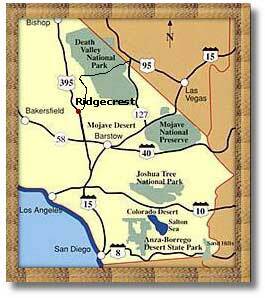 Ridgecrest, incorporated in 1963, is located in the northeast corner of Kern County in the Northern Mojave Desert. Prior to the establishment of the Naval Ordnance Test Station (NOTS) at Inyokern in 1941, Ridgecrest, then "Crumville," consisted of a few scattered farms and homesteads. Ridgecrest evolved during the 1950's and 1960's as a support community, vital to the mission of NOTS, by providing housing and services for Federal employees and contractors. NOTS, later China Lake Naval Weapons Center (NWC) and now the China Lake Naval Air Weapons Station (NAWS) home to the Naval Air Warfare Center (NAWC) Weapons Division, continues to be the major source of employment for Ridgecrest residents. At the same time, NAWS depends increasingly upon Ridgecrest for support services. The economic stability Ridgecrest has enjoyed as a service community for the NAWS has been essential to its successful emergence as a community in its own right. Barstow, California: 88 miles southeast. Inyokern, California: 12 miles west. Trona, California: 30 miles east. Bishop, California: 120 miles north. Big Pine, California: 105 miles north. Lone Pine, California: 60 miles north. Victorville, California: 81 miles south. Mojave, California: 60 miles southwest. Lancaster, California: 78 miles south. San Bernardino, California: 115 miles south. Death Valley National Park: 61 miles east. Red Rock Canyon State Park: 31 miles west. Saddleback Butte State Park: 98 miles south. Sequoia National Park (via Whitney Portal): 80 miles north.